Every few weeks us parents groan a little when we see our cherubs appearing from the door struggling with their story sack. In fact, they are an amazing resource that nobody really knows the history of, they are part of the school’s heritage and some amazing working party or PTA group must have made them with love and skill in equal measure. 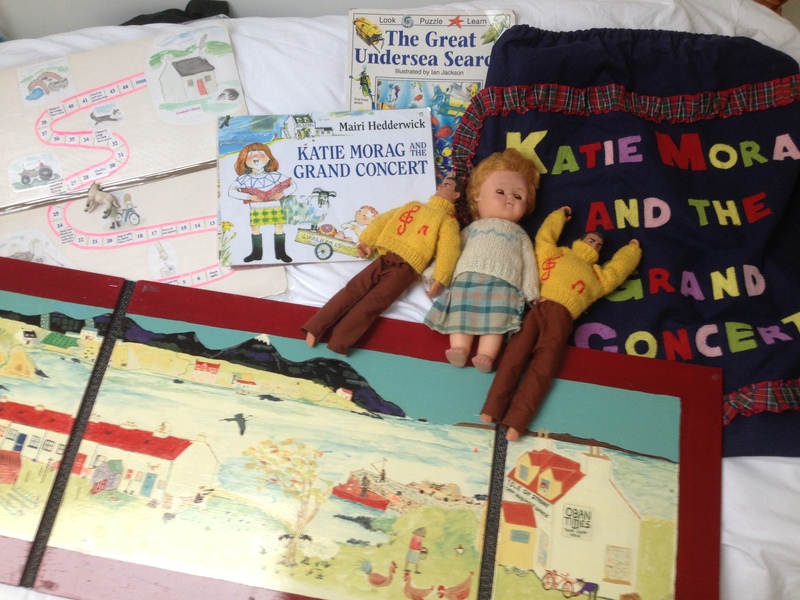 They are unique and charming, this week we got Katie Morag and the Grand Concert by Mairi Hedderwick. 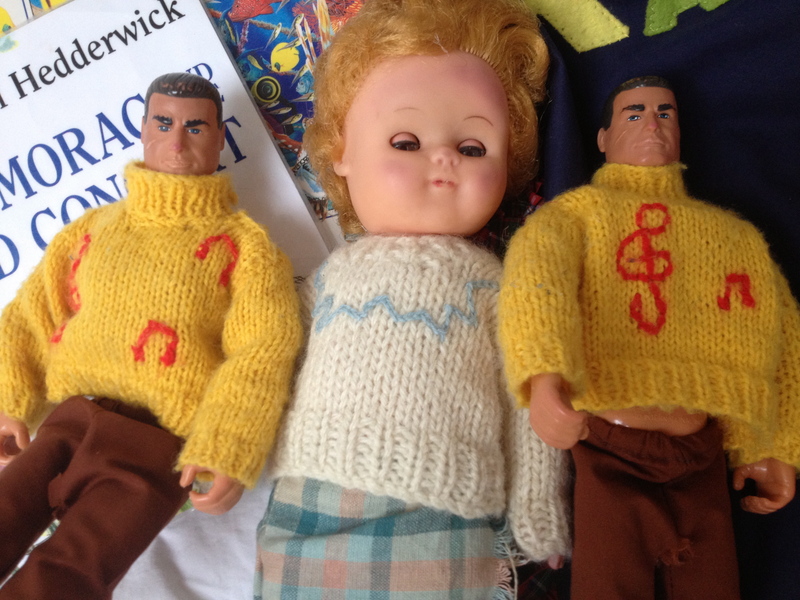 What’s in the sack is incredible, there are the twin uncles in matching home knitted jumpers, Katie Morag herself complete with kilt and a hand made game. Every story sack has another book that ties in with the main book and there’s usually a cd for the audio version of the book. 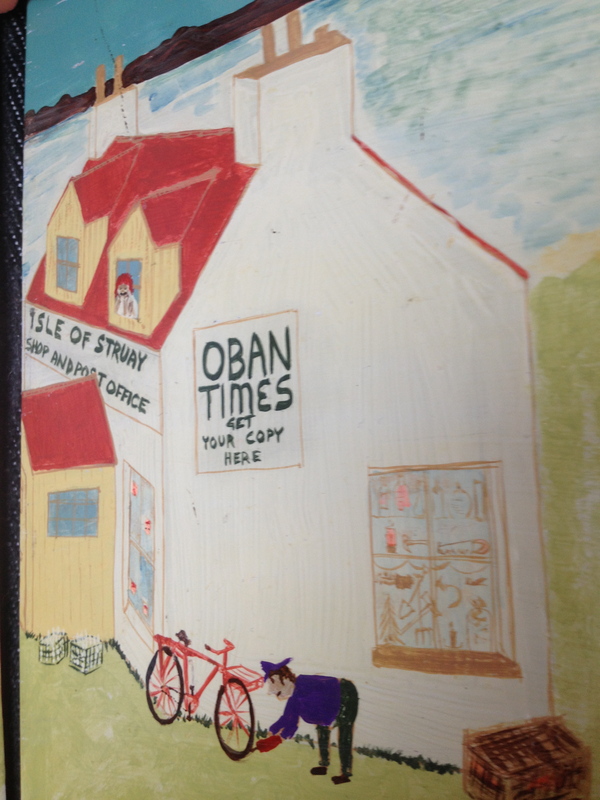 The most incredible piece in this sack is the hand painted scene, taken from the front cover of the book, it is amazing, how long it must have taken and what a beautiful thing it is. The actual sack has applique lettering and tartan trim, all hand done. Once you to stop and think about the effort involved in making this treasure it makes trying to find all the bits and bobs seem a tiny job. I’m not sure how many bags there are but I am so very glad they exist to help nurture our children’s love of books and reading. I absolutely promise not to groan when I see my little girl struggling out with the next one, not even a sigh will pass my lips. No, I’m going to be that slightly embarrassing, irritatingly enthusiastic mum we all cringe at sometimes. Was just looking back at the first few posts, we really have come a long way, it’s easy to forget what has been achieved when you are fretting about what’s still to do. Well, the day did arrive and so did the builders, or should I say the demolishers? I had left for work before they arrived so when I got home to an open van full of debris in the drive I couldn’t wait to get in to see what they had been up to. I was not disappointed. What a day’s work.